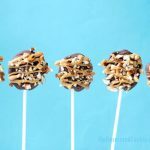 Twix cookies on a stick, a homemade version of the candy bar classic.. 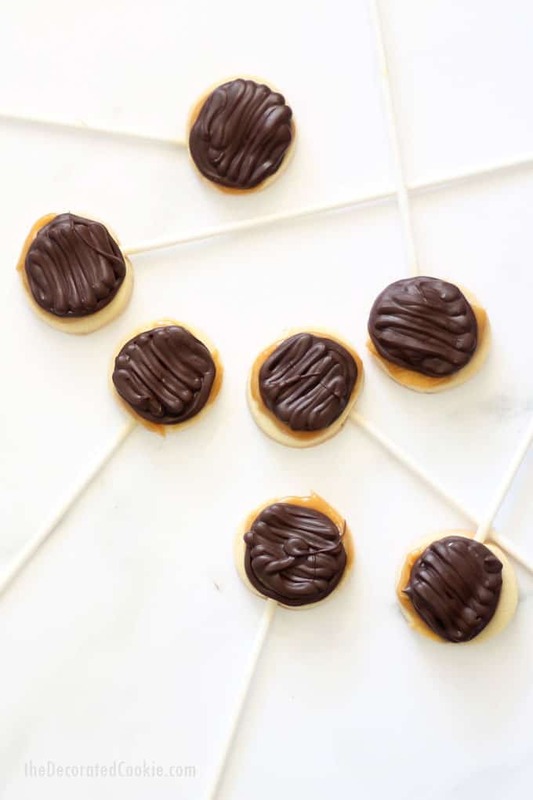 These homemade Twix cookies on a stick (Twix cookie pops, if you will), taste even better than the classic store-bought candy bar. 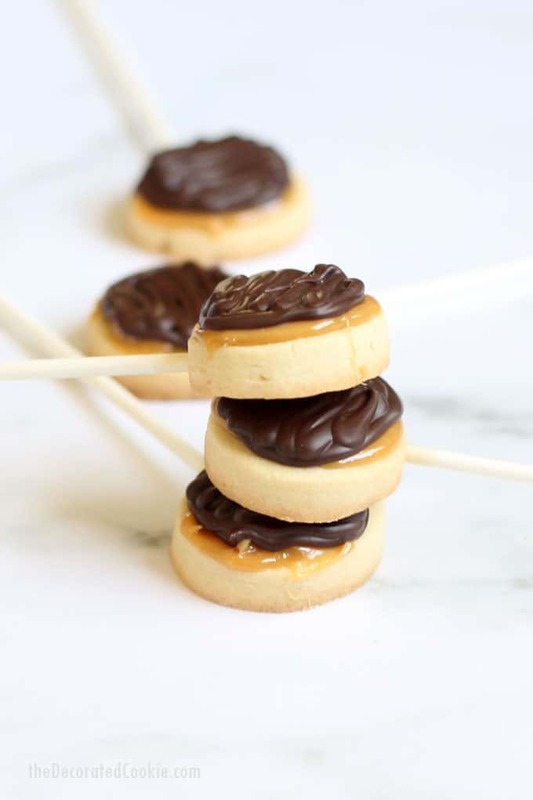 While I love store-bought Twix candy bars, these homemade Twix cookies on a stick are a jillion times better. Not only are they delicious, but they are so cute and easy to eat. Create a bouquet for your Twix-loving friend, make them for a conversation-starting party treat, or just bake up a bunch for your own sweet tooth. The first Twix candy bars appeared in the United Kingdom in 1967, and they made their way to the United States in 1979. (In the ‘80s, the candy was named “Raider” in mainland Europe.) 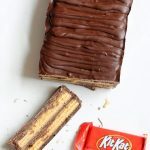 The candy bars feature a butter cookie topped with caramel and coated in milk chocolate, just like this homemade version. 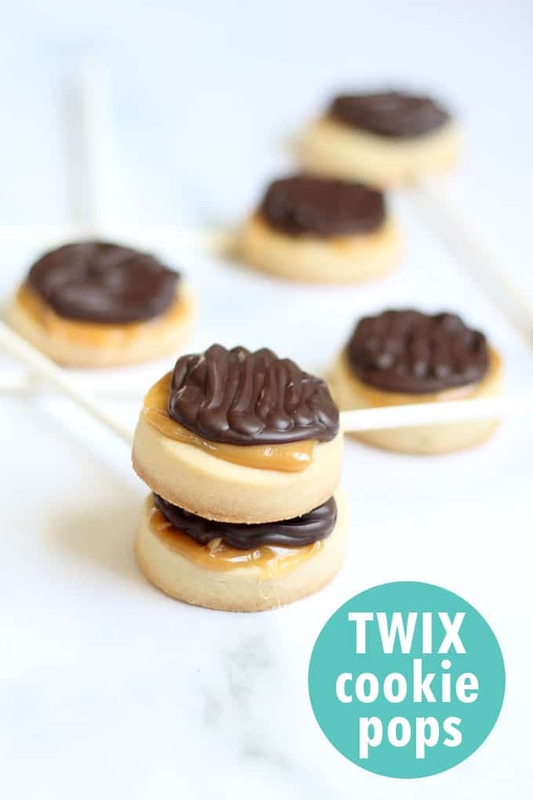 To make these Twix cookie pops, I start with my never-fail, always-perfect, easy shortbread cut-out cookie recipe. Then, just top with caramel candies melted in the microwave and your favorite chocolate. I use a pretty small cookie cutter, only an inch and a half, because I like the darling, easy-to-eat size, and because on sticks, too large a cookie can be top-heavy. 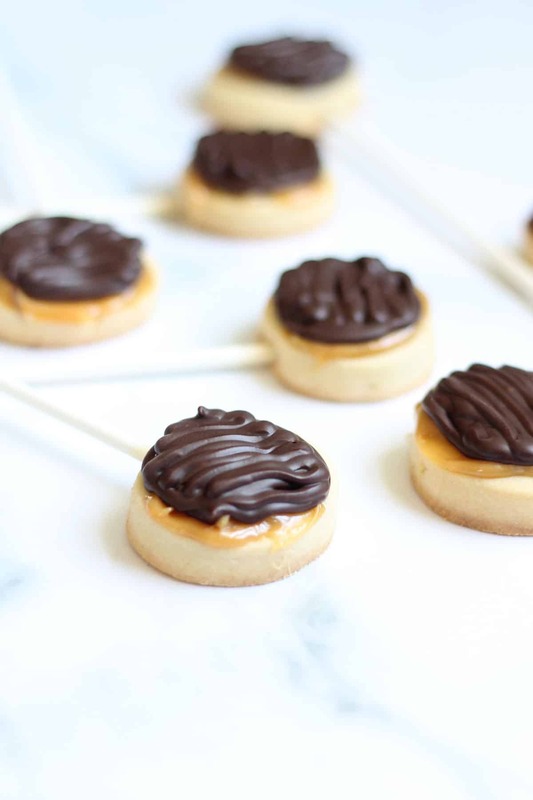 If you are opting to skip the lollipop sticks, you can make these any size circle (although the yield will of course be lower with bigger cookies). To spread the caramel, I prefer using an off-set spatula. But if you don’t have one, any knife will do. To better mimic the candy bar, opt for milk chocolate chips. 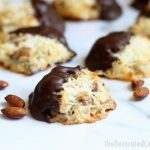 I like my sweets a little less, um, sweet, so I use semi-sweet chocolate, which I find is a good balance to the cookie and caramel. To spread the chocolate, I transfer the melted chocolate to a disposable decorating bag, snip the tip, and pipe the chocolate on top. I find this so quick and easy to do, it’s my go-to secret. However, you can also use a Ziploc bag, preferably the freezer-grade bags because they are thicker, or a knife to spread. As long as you have the cookies, caramel, and chocolate, you have your Twix! If you’re a fan of chocolate and caramel, you’ll also want to try this chocolate “crack” bark! 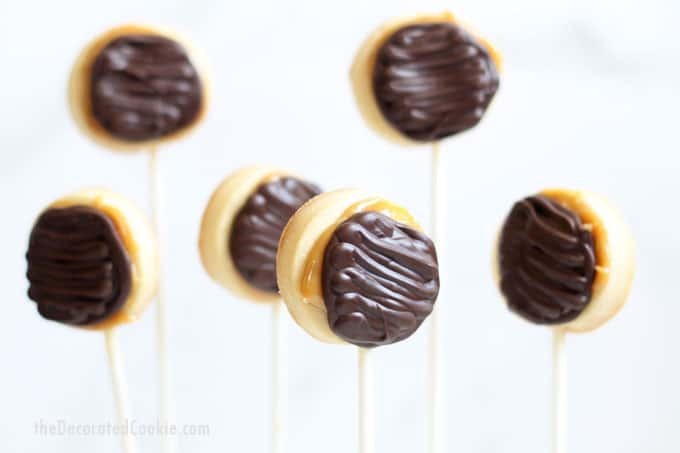 Like these Twix cookie pops and want to see more homemade candy bar twists? 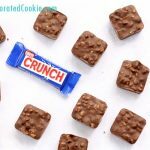 Try this 2-ingredient Nestle Crunch bar, or this GIANT Kit Kat bar. Here is a Take Five candy bar version on a stick. 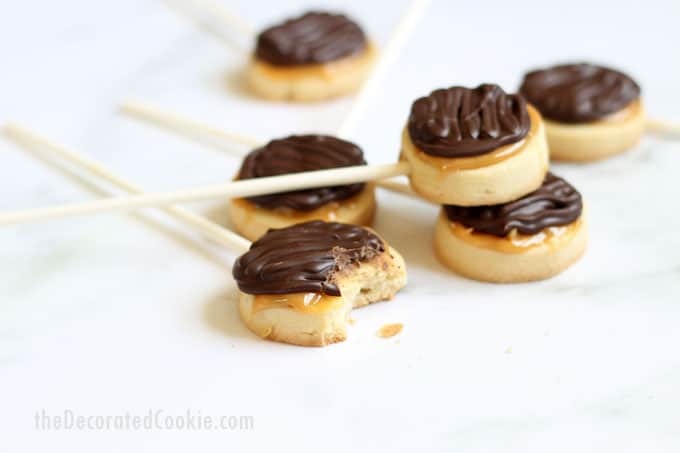 This post for homemade Twix cookies on a stick also appears on Food Fanatic. Oh thank you for the Twix biscuit recipe, I made these today for my Friday Food on my blog. They turned out so well, even though I lived on the edge and didn’t chill the dough at all. They are just great!! Oh, that’s fantastic!! I’m so glad it worked out!! Go you, not chillin’ the dough.